When determining the classification of orange trees, several aspects define particular categories of this plant. From the type of fruit they produce to their preferred habitats, the tree you associate with orange juice and sunny locations is a multifaceted plant. Identify different characteristics of orange trees for a clear sense of their classification. 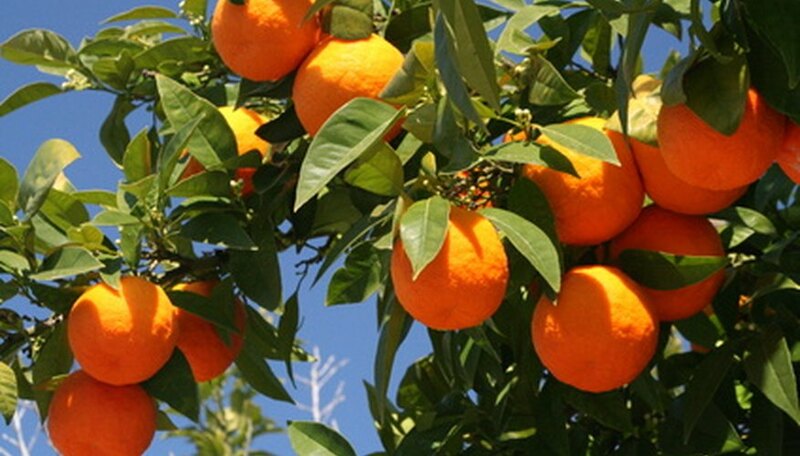 Orange trees are classified as a subtropical plant, according to the Texas Cooperative Extension. Thriving in both tropical and subtropical climates, oranges are grown worldwide and prefer warm temperatures and humid conditions. Areas like Texas and Florida grow these citrus trees. Orange trees are native to northeastern India. Though drought-tolerant for short spurts, orange trees need an adequate water supply for healthy growth. Orange tree classification includes their membership to the citrus family (Rutaceae). The citrus fruit produced by orange trees is consumed as fresh fruit. Sweet orange trees produce the following orange types: blood oranges, pigmented oranges, acidless oranges, round oranges and navel oranges, according to the Texas Cooperative Extension. Navel oranges are considered the friendliest orange fruit for eating straight from the tree without utensils due to the ease with which the skin peels from the inner fruit. One classification of the orange tree is its status as a flowering tree. The orange tree produces flowers known as orange blossoms. The blooms are heavily fragrant with a pleasing scent; orange blossoms attract honey bees, yielding orange blossom honey. Flowers are a cream/white hue with yellow anthers, surrounded by dark, waxy green foliage. Orange trees are tender plants, meaning they are not cold-hardy. Hardiness classification includes USDA hardiness zones 9 to 11 for best growth. Orange trees often need cold protection when temperatures dip, but a sudden onset of cold temperatures can cause hard-to-avoid injury. In residential planting, it is wisest to plant orange trees on the south side of a building to increase potential for a warmer environment. Additionally, areas exposed to full sun keep oranges out of cool, shaded areas. Freezes have the potential to kill orange trees, according to the Texas Cooperative Extension. Sweet oranges are classified based on cultivar. Many are household names seen in the grocery store. Valencia oranges are grown in California and Florida, producing an orange with thin skin, often used for juice. Valencia is the most commonly grown cultivar worldwide, according to the Texas Cooperative Extension. When grown commercially, Hamlin oranges are considered seedless, producing zero to six seeds per fruit; the oranges are smaller and display a thin peel. Other cultivars like the blood orange group include fruit with red flesh and a flavor reminiscent of berries.